At the rate peaches disappear around our house, I was despairing of ever having enough ripe ones to make a peach cobbler! However, I stocked up on them and over the weekend I made this recipe. I found the original version at All Recipes but changed it up a bit. Served with whipped cream, it had just enough sweetness to complement the peaches deliciously! In a large bowl, combine peaches, two tablespoons white sugar, two tablespoons brown sugar, 1/4 teaspoon cinnamon, nutmeg, lemon juice, and cornstarch. Toss to coat evenly and pour into a 2-quart baking dish. Bake in preheated oven for 10 minutes. Meanwhile, in a large bowl, combine flour, 1/4 cup white sugar, 1/4 cup brown sugar, baking powder and salt. Cut in butter until mixture resembles coarse meal. Stir in water just until combined. Remove peaches from oven and drop spoonfuls of topping over them. Sprinkle teaspoon of cinnamon over cobbler. Bake until topping is golden brown, about 20 minutes. Find more recipes at Tempt My Tummy Tuesday, Tasty Tuesday, Tuesdays at the Table and Delicious Dishes. Oh, it sounds so good! 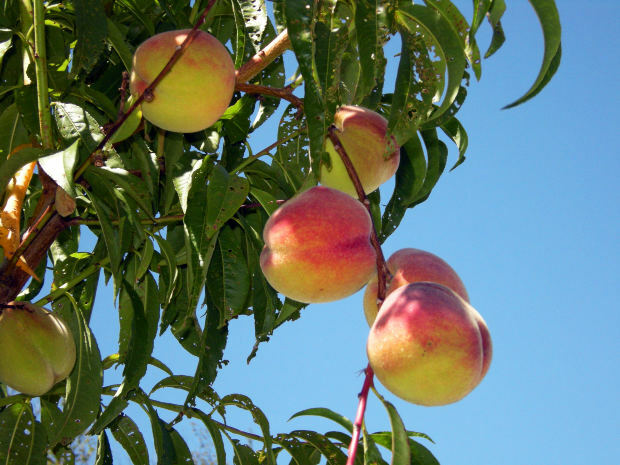 It must be fantastic to have a peach tree. Oh, yum. Don't you just love fresh summer produce? Yuuummm, fresh peaches. You southerners know how to do it right! I need to make this sometime. I've not made one as yet. Our peaches aren't even close to being ripe yet. When they are, we will live on cobbler. It is the perfect peach dessert. Oh yum! 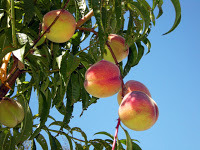 I have EXACTLY 8 white Jersey peaches sitting on my counter right this very minute just begging to be made into cobbler. YUM! Peach cobbler sounds wonderful! Thanks for sharing and linking to TMTT.